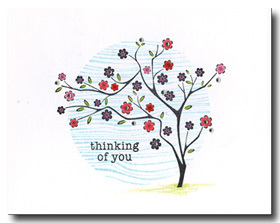 Pair the Slanted Tree with the Woodgrain Circle to create a simple yet versatile card. Stamp the woodgrain circle in the center of a white card with soft blue ink. Stamp the slanted tree and the message in black over the circle. Add color to the flowers and grass with color pencils. Challenge yourself to keep it simple by limiting your card to one layer.